For the production of flat products, liquid steel is generally cast in form of slabs in continuous slab casting machines. These slabs are inspected, scarfed and then reheated in slab reheating furnace to the rolling temperatures before being rolled to hot rolled coils in a semi continuous or continuous hot strip mill. Development of thin slab casting and rolling (TSCR) is a step forward to reduce the number of process steps in the production of hot rolled coils (HRC). Originally TSCR technology was developed with the primary goal of reducing the production and investment costs but today it has become one of the most promising production routes to maintain steel as a leading material in technological application and it is being considered as the technology which has reached a high degree of maturity. Casting speed of 6.0 m/min for slab thickness of 50/55 mm is quite common. Initially, only commercial quality plain carbon steels were being cast through thin slab caster route. But presently most of the steel grades including low, medium & high carbon, HSLA line pipe grades and steel grades for automotive application including IF grades can be cast through thin slab caster route. In fact this technology has brought paradigm shift in steel technology of casting and rolling. The thin slab casting and rolling technology was made possible because of the following improvements in casting and rolling processes. The implementation of TSCR concept did not achieve any success till mid eighties due to numerous technological challenges associated with the technology. The first breakthrough in this direction was achieved in October 1985 by SMS Schloemag-Siemag when the first thin slab of 50mm thickness was cast in a pilot plant in Kreuztal-Buschhutten. This success was achieved with apatented funnel shaped mould and an optimized submerged entry nozzle. SMS Schloemag-Siemag gave to this technology the name of “Compact Strip Production (CSP)”. The first CSP plant was ordered in late 1987 and was commissioned at Nucor Steel, Crawfordsville, Indiana in July 1989. Within few days of commissioning there was a major break out in the casting machine because of inexperienced operators. This has an effect on the speedy acceptance of this technology. Almost at the same time, the In-line Strip production (ISP) process was under intensive development by Mannesmann Demag and Arvedi group. Development of ISP started in 1988 based on an Arvedi-Mannesmann patent. In 1992, the prototype ISP plant was built by Arvedi at its Cremona works, with most development carried with the plant. In 1994-95 the prototype plant completed the first phase of its development. Later based on the ISP technology, Acciaieria Arvedi has developed a new thin slab casting/endless rolling process under the brand name Arvedi ESP. With this process o.8 mm thick strip is being produced. Voest Alpine (VAI) of Austria (Now Siemens VAI) and Danieli of Italy have also developed thin slab casting and rolling technologies. The technology of VAI is known as Continuous Thin Slab Casting and Rolling Technology (CONROLL) and produces slabs up to thickness of 125 mm. It is more of medium thickness slabs. The technology developed by Danieli is known as Continuous flexible Thin Slab Rolling (fTSR) and produces slabs in the thickness range of 70-90 mm. Implementation TSCR technologies got a major boost after China and India started expanding its steel production in a massive way. Today a three strand TSCR plant based on CSP technology has been installed at ESSAR Gujarat, India. The liquid steel after steel making is teemed into the tundish of the continuous casting machine. The steel is cast into slab of the desired thickness of 40 mm to 70 mm. 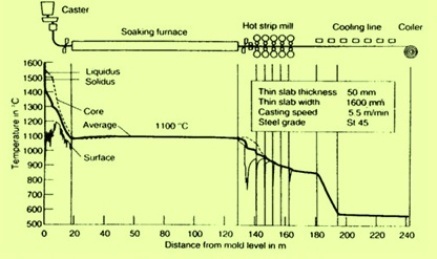 The slab is then sheared to the proper length and transported to the tunnel or equilibrating furnace normally set at a temperature of 1150 deg C. At this point, the slab exhibits an austenite grain size of 500-1000 ?m. After the 20 minute residency time in the furnace the slab exits the furnace and is crop sheared. The hot thin slab then enters the finishing mill at approximately 1000 deg C. The slab is rolled into hot strip as it passes through the finishing mill of 5, 6 or even 7 stands. The hot strip after rolling enters the run out table (ROT) where it undergoes cooling to the coiling temperature. It is then coiled to room temperature. This process is shown schematically in Fig 1. In this process liquid steel is cast in a slab casing machine with a multi bending mould having servo hydraulic oscillation. The slab exit from the machine at a thickness of 70 mm and undergoes soft reduction as it travels down the 5.2 m radius casting machine to emerge at a speed of 5.5 m/min and at a max thickness of 55 mm. The slab is then rolled in a 3 stand roughing mill for reduction to 10-18 mm transfer bar. The transfer bar is cut to length in a pendulum shear and then passes through an induction furnace to raise the bar temperature by 150-250 deg C. After this the transfer bar goes to ‘Cremona’ furnace which consists of two coilers housed in insulated chambers. One coiler is accepting and coiling transfer bar from induction furnace while the second coiler is de-coiling and feeding to the hot rolling mill. Cremona furnace not only decouples the casting and the roughing stage with the finishing stage but also it acts as a dynamic buffer and homogenizes the temperature profile of steel for further rolling in finishing stands. Finally the hot strip passes along a laminar water flow cooling table and coiled in down coiler. This process is shown schematically in Fig 3. The Thin slab casting and rolling process marketed by Danielli consists of flexible thin slab casting (fTSC) unit connected to thin slab rolling unit (fTSR) through a tunnel furnace. fTSC unit is able to cast slab of thickness 60 mm. The caster is of vertical curved design, having funnel mould with soft reduction and air mist cooling. Rolling mill consists of a finishing mill consisting of 6/7 rolling stands in cluster configuration. This process is shown schematically in Fig 4. While processingthe steel in TSCR process from tundish to coiler the metallurgical features are important. Rapid solidification of the thin slab refines the dendritic structure and contributes to greater homogeneity. Non-metallic inclusions are small and globular, retain their shape during hot-rolling and contribute to isotropic properties (toughness, bendability). All added micro-alloying elements remain in solution. Because of the high temperature of the cast slab prior to hot rolling, premature precipitation is avoided. To minimize the difficulties of casting in the peritectic region, the carbon content of many micro-alloyed steels is restricted to between 0.05% and 0.06%. This restriction benefits toughness and weldability. The high temperature of the slab during bending and unbending minimizes the tendency to form transverse cracks. The temperature in the equilibrating furnace depends on the micro-alloying element and is designed to keep the micro-alloy in solution. Direct charging is the main factor that reduces energy consumption during hot rolling. In rolling thin slabs, the deformation in the initial passes often exceeds 50%. Heavy deformation at high temperatures is essential to refine coarse (over 1000 ?m) austenitic grains by re -crystallization. The refinement and uniformity of austenitic grains is a prerequisite for a fine ferritic structure down to 4 to 5 ?m. Accelerated cooling on the run-out table and under cooling of the austenite further refines the ferrite. The production process and typical level of temperature evolution in the TSCR process is shown in Fig 5. The following are the major advantages of thin slab casting and rolling technology. Very informative article, Sir. Sir, I have two questions 1)Is there any disadvantage of this process compared to conventional process for producing any special grades ? 2) Any steel producer in the world is using TSCR for CRGO/CRNO production?